I spent the entire day cleaning, and organizing the mess that is/was my guest room/sewing room. It felt so good to finally get it done. I took quite a lot of pictures so I hope you have time to sit back and enjoy them. I was so excited when we moved into this house 6+ years ago to finally have my own room for sewing and crafts. 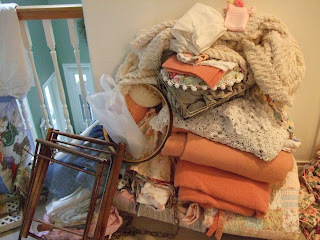 In our last house I had to do all of my sewing in a tiny corner of the family room. Needless to say, cutting fabric on the floor is not the way to go. I actually sliced a small chunk of my finger off with my rotary cutter doing just that. It still gives me the heebie jeebies when I think about that. Anyway, on with the tour. Here is a shot from the doorway. It is really a pretty small room, but I sure managed to pack a lot into it. I don't consider myself to be a very organized person, but I have to be somewhat organized if I am ever going to find anything in here. As you step into the room, the first thing on the right is my cutting cabinet, the one thing I didn't take a picture of. Straight ahead is a vanity bench I had as a kid that I recovered and next to that is a vintage wicker cabinet, full of fabric of course. The antique metal bed I got from my friend Anita who used to be an antiques dealer. I love this bed, it is very crusty and chippy. I bought a new mattress for this bed when we moved in and I have to say, this is the most comfortable bed in the house. I love this little cabinet. I got it at an antique shop in Tigard, a neighboring town. 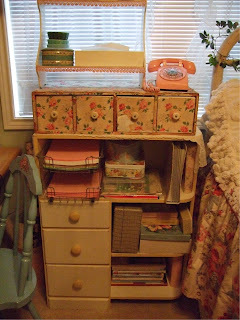 Did I ever mention that I have an addiction to cute cabinets? Shelves are another thing I just love. 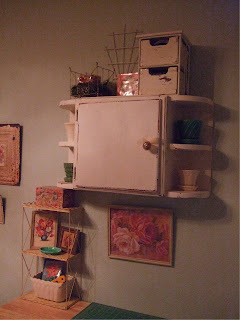 Cute interesting metal or chippy wood shelves are my favorite and I have a hard time passing them by when I see them. If you didn't already know that I love roses, then seeing this room will convince you. This is the wall above my bed. 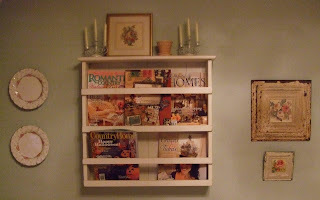 I got the little plate rack, not old, at Monticello, it is perfect for magazines and books. The larger rose ceiling tin was made by Isabel, I bought it at a craft bazaar before we really even became friends. The smaller one I made. I bought a big piece of crusty tin at an antique mall for $29. A huge price for me to pay, but I had my hubby cut it down and I made 30 of these rose tins and sold them for about $12-$15 each. This is the very last one and I'm glad I kept it. I wish I had kept more. 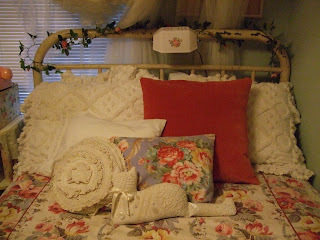 Everything on this bed, with the exception of the quilt which I bought new on ebay, was thrifted. I love the little bed light. Of course I added the decal. The joke at our first Expo we did three years ago was, if I put a rose decal on it, it sold. Gotta love those little touches. The cranberry velvet pillow I got at goodwill, the little floral pillow I made out of a piece of fabric I got last year at the Brownsville Antique Fair. The pillow inside it which you can't see, is made with a cute little ticking piece I bought at a flea market in france. I had it in my booth for sale and no one wanted it, so I brought it home and here it will stay. The ruffle crochet pillow I bought from Shannon Quimby when she had her shop open and the kitty pillow was made by my mother in law, Judy. But, the bestest find on this bed has to be the barkcloth era twill bedspread I bought at Monticello. Love it! Feel free to click on pictures to get a close up view. 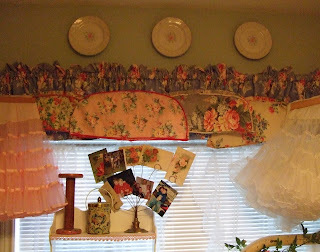 This shot is of the window area where I have a vintage rose fabric valance which I found in Aurora, along with a couple crinolines and some fabric covered hanger covers. 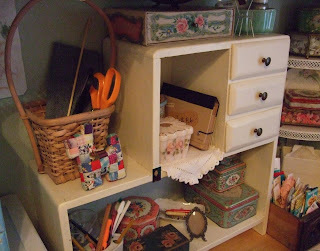 I got this yellow and white cabinet from Shannon Quimby's shop and it's great for holding a lot of my craft supplies, I love the shelf and drawers combo. The little wallpaper cabinet on top I got at Expo for $18. I love these, but usually they are out of my budget. I just had to have this vintage pink phone in here. Don't you think it is perfect in here? Moving to the left you will find my sewing area. My mom can't believe I can make anything in this tiny space, but it works for me. The shelf above came out of a rebuilder supply center for $25 which I think was a great deal. I had it at my last house too and it holds a lot of stuff. Recognize the little blue cabinet from a previous post? The little green cabinet came from Joy and holds my extra cabinet knobs/hardware. 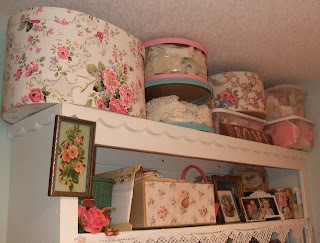 Here are some hat boxes which hold lace and smaller pieces of fabric. I love the scallopy edge on the cabinet. Just added the lace to the shelves recently. 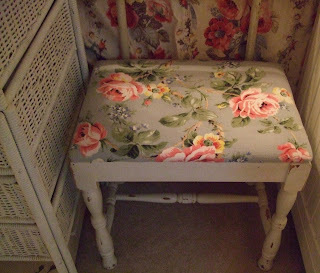 Vintage wallpaper drawers hold, what else, more fabric. I got this cute and funky cabinet from the Girlfriends at Monticello. See the little scotty dog quilted pin cushion? I got that at one of my favorite shops in Temecula California call "Serendipity." I couldn't resist. But, one of my all time favorite finds is the little blue box with the handpainted roses. I got it on ebay for next to nothing. I would love to be able to paint roses like that. Definitely not one of my talents. 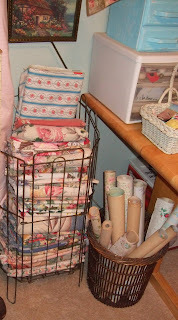 Next to my sewing area is my collection of vintage barkcloth and barkcloth era fabrics in an old shopping cart and some of my vintage wallpaper. Above my armoire which came from my hubby's family. It is a beautiful piece. Not sure why I didn't get a picture of it, but I took a pic. of the stuff on top of it. Gotta have the tv for background noise when I am working in here and it is handy for guests too. This is where my ironing board lives when it is not in use, so basically, it only lives here when we have company. 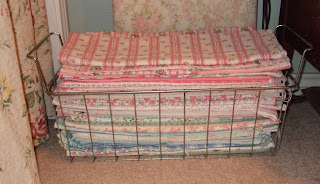 My obsession with vintage ticking fabric. 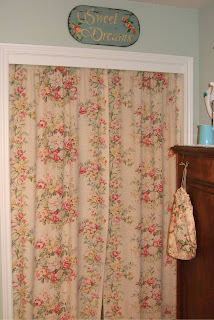 Hated the closet doors so I hung these cute barkcloth drapes. Got these from Isabel who bought four panels on ebay and only needed two. Lucky me! Are you still with me? I know this is a lot of pictures, but I promise, I'm almost done. Since I can't leave any space undecorated, here is the back of the door. I found this great metal hanger rack on ebay. 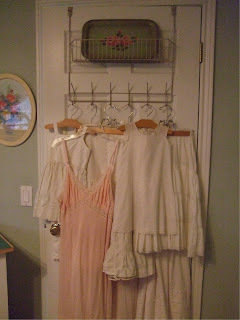 It is chippy and rusty, but perfect for hanging some cute vintage garments on it and of course another tole tray. This is the only tole tray that managed to make it in this room if you can believe it. So that is pretty much it. I hope you enjoyed the tour of my guest room. My only question now is what do I do with all of this? 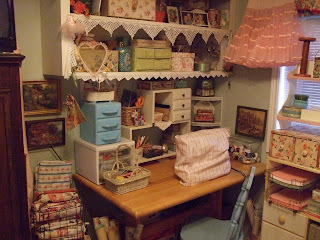 OK...I am drooling over everything in your sweet little craft room! It is so, so charming. What wonderful treasures you have...I could live in there! I love your guest/craft room. This post had definitely inspired me. I sew in my guest room and just never have enough room for storing fabric or my craft supplies. I love, love, love all your ideas that you've used in this room and it's so cozy and inviting!!!! Oh my!! You have my dream craft/guest room! REALLY! It's almost exactly as I have envisioned mine in my mind's eye! Oooooo, I am going to go back and enlarge every picture!! Wow! Now that's what I like to see. 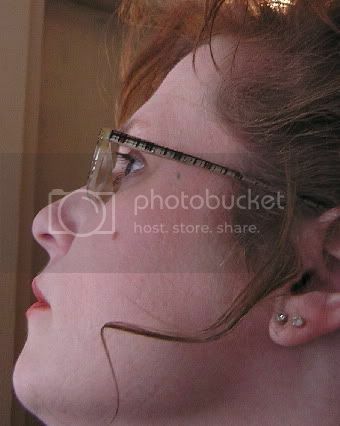 A real person decorating a real guest room/sewing/craft room. My daughter's old room looks just about the same size and I couldn't visualize anything I could do with it. Now I can. Thank you! This is just beautiful! Thanks for the tour! 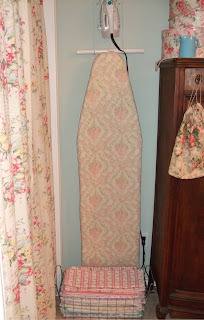 Oh cute, even your ironing board is pretty! Okay Lisa, I have a room that looks just like that, complete with sewing machine, lol...I also call it my guest room though I don't know where the heck I'd put a guest. I love it, especially your shelves...I love shelves, too. Bought a "boat" knickknack shelf last week, will hang it, you guessed it, my GUEST ROOM!!! Oh Wow!! 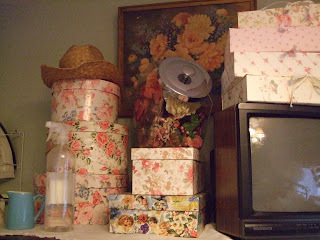 I am hyperventilating over all of the beautiful rose boxes and rose fabrics in your studio! I would love to have a room all to myself. Gorgeous!! I want to open all of your boxes and see what else is lovely inside. I'm gushing, but, this is awesome! It all looks lovely. Unfortunately my craft room is our dining room as there are no bedrooms to spare. 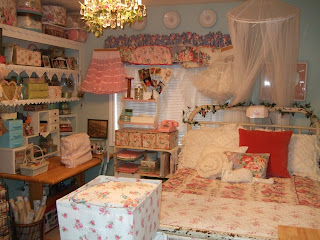 I love the above bed light and laughed at your comment about the rose decals. What a charming room! It's just yummy I would be very happy living in it. There are just so many treasures I keep finding more, and more when I look at your pictures....thank you for sharing. That was fun, fun, fun to tour your sudio! My eyes inched slowly over every little goody you have in there. If I commented on every thing I liked, I would use up all of blogger's space. LOL I'm going to redo a bedroom into a studio in the near future. This really inspires me! Oh my-what a GORGEOUS room!! 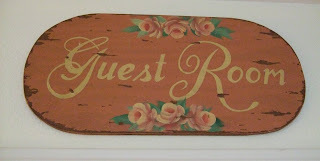 Everything is delicious in it-and I love the little guest room sign!! I LOVE your room!! I have been working on my work room lately and I have a long way to go. Yours looks so cozy and I want to go through all of your stuff!! I want to see pictures of inside your hat boxes! Hi I wanted to let you know you have an award to pick up over on my blog! 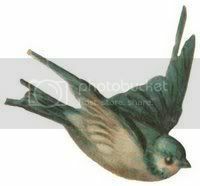 Hi Lisa, what a pretty blog your have. I loved your rose box, very beautiful. I"m a lover of roses also, of many garden flowers actually. One of my favorite hobbies. Have a good evening. What a most interesting room. Thanks for sharing. By the way, your guest room reminds me of my own 9x10 guest room. 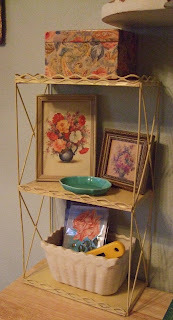 See my post from Oct. 17 on thrifting for country decor. oh wow, it's gorgeous!!! i just moved to new york and have been looking all over for furniture that i like, and flea markets that sell decent things. so far it's been really depressing.